Alexandre Bissonnette, a 29-year-old former politics student fixated on President Trump, the far right and Muslims, was sentenced on Friday to life in prison without the possibility of parole for 40 years for shooting six people dead in an attack on a mosque in Quebec City in January 2017. During the attack, Mr. Bissonette shot several worshipers in the head. Nineteen people were injured, including one who was paralyzed for life. Under Canadian law, Mr. Bissonnette could have gone to prison for 150 years — or 25 years for each of the six deaths. While underscoring the brutality of the attack, Justice François Huot of Quebec Superior Court suggested that such a harsh sentence would be excessive by denying the defendant the hope of ever leaving prison. But Muslim leaders, including the mosque’s president, Mohamed Labidi, said they were deeply disappointed by Justice Huot’s sentence, saying it did not do justice to a horrific crime. Several family members of victims sobbed. Legal scholars said his decision was likely to be challenged on appeal and could end up before Canada’s Supreme Court. And once there, they said, it could become a seminal test of the constitutionality of consecutive life sentences. Justice Huot discussed the 2011 Canadian criminal law, introduced by the previous Conservative government, that allows a judge to give sentences in 25-year increments in cases of multiple murders. He said that a 25-year sentence was not severe enough in this case, given the severity of the crime, but that 50 years or more would be excessive. In what legal scholars called an “extremely complex judgment,” Justice Huot parsed his decision by sentencing Mr. Bissonnette to life in prison with no chance of parole for 25 years on the first five counts of murder, and added 15 years for the sixth count. Kent Roach, a law professor at the University of Toronto who specializes in criminal law, called the judgment “innovative” and said it was likely to be challenged. Noting the case of Bruce McArthur, who was convicted of killing eight men associated with Toronto’s gay community and sentenced on Friday to life with no chance of parole for 25 years, Professor Roach said the sentences suggested that Canadian courts had a less punitive culture than the United States. “Both judgments reflect that Canadian judges are reluctant to give crushing sentences even for the most heinous crimes and resist inflexible sentencing laws,” he said. Prosecutors had argued that six consecutive 25-year jail sentences for each of the six first-degree murder charges befitted the heinousness of the crime, which they called both “violent” and “racist.” Mr. Bissonnette pleaded guilty last year to the charges. In an interview before the sentence was handed down, Irwin Cotler, a prominent international human rights lawyer who served as Canadian justice minister and attorney general, noted that the judge would have to consider the egregiousness of the crime as well as Mr. Bissonnette’s mental state. “Sentencing in cases of multiple murders are supposed to bear in mind the principles of retribution and denunciation,” he said. Mr. Bissonnette’s attack on the mosque convulsed Canada, shocking a country that prides itself on its multiculturalism. The sentence comes amid a rancorous debate in Quebec after the province’s premier, François Legault, drew opprobrium from Muslim leaders last month for contending that Islamophobia wasn’t a problem in Quebec. His office later qualified that he did not mean Islamophobia didn’t exist, but, rather, that it wasn’t systemic in the province. Still, his remarks — two days after the second anniversary of the mosque attack — were greeted with anger by survivors, including Aymen Derbali, who was hit with seven bullets and paralyzed from the waist down after trying to distract Mr. Bissonnette during the rampage. “There is Islamophobia — the proof is what happened at the mosque,” he told reporters at a ceremony last month, where he was being honored for his bravery. During a sentencing hearing that lasted for several weeks last year, the prosecution argued that Mr. Bissonnette had killed in a premeditated fashion and approached his victims with a coldblooded ruthlessness that merited the toughest sentence the law allowed. The court heard that Mr. Bissonnette was a socially marginalized young man who had become enthralled by far-right websites and obsessed by serial killers, Muslims and Mr. Trump’s tweets. In the month before the attack, he surfed the internet 819 times for posts related to Mr. Trump, including the American president’s travel ban on several Muslim-majority countries. Mr. Bissonnette had targeted the mosque just hours after he learned of a tweet by Prime Minister Justin Trudeau welcoming refugees to Canada who were being spurned by Mr. Trump. But the defense presented a contrasting narrative of Mr. Bissonnette, describing him as a slight young man who had been mercilessly bullied at school. The defense suggested that society had failed him and that he deserved empathy and the chance for rehabilitation. 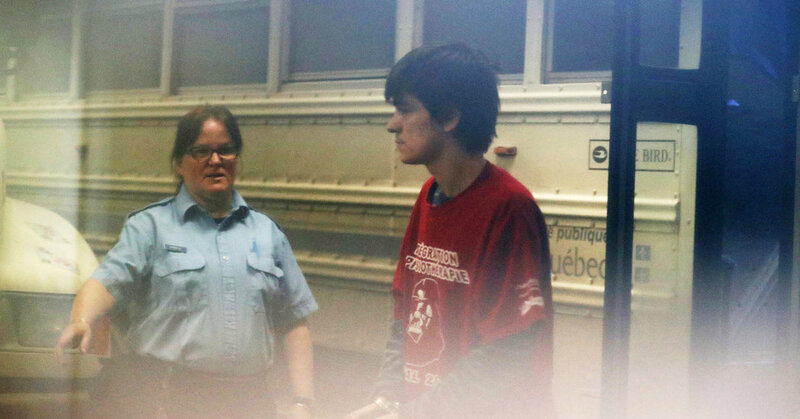 His defense lawyer, Charles-Olivier Gosselin, told the court that Mr. Bissonette suffered from chronic psychiatric problems, and did not fit the violent profile of a serial killer for whom consecutive sentences were appropriate. Mr. Gosselin had proposed a life sentence with the possibility of parole after 25 years. Mr. Bissonnette, he argued, had showed signs of remorse, had cooperated with the police and had surrendered after the attack.